Welcome to the Prop Wash Gang Reunion Site. Our next Prop Wash Gang reunion will be in Syracuse, NY, Wednesday through Friday, 2-4 October 2013 in conjunction with the dedication of a long-overdue memorial that is being sponsored by the PWG and Syracuse University [See inset below]. Larry Tart is the PWG's point of contact for related activities. In Memoriam The Prop Wash Gang and Syracuse University are partnering in a project to create a memorial on Skytop that pays tribute to the victims of the fire and their families. The PWG is funding/delivering to the university a memorial plaque that will honor those killed and injured in the fire. Near the footprint once occupied by barracks M-7 on Skytop, the university is designing and preparing the selected memorial site. University personnel will also mount the plaque on the newly created memorial and landscape and maintain the Skytop Memorial. The layout of Barracks M-7 that burned in 1959 and the other prefabricated buildings on Skytop at that time are overlaid on this Google map of Skytop. Reunion Headquarters -- Our PWG Reunion Headquarters will be in the Best Western Plus Carrier Circle Hotel, 6555 Old Collamer Road South, East Syracuse, NY 13057. Located just off Carrier Circle at Exit 35 of the New York Thruway (I-90), the hotel is close to Syracuse Hancock Airport (7 miles), Syracuse University (9 miles), Armory Square/Downtown (9 miles), Destiny USA - 2nd largest mall in USA (7 miles), and 30 minutes (28 miles) to the Turning Stone Resort & Casino, Verona, NY. For driving directions to the hotel, consult a Google map. A 100% Smoke-Free facility with complimentary shuttle service for guests arriving at Hancock Airport, our hotel has typical amenities: free parking, elevators, heated indoor pool, free wireless internet, business center, computer for guest use, complimentary hot buffet breakfast, etc. Among their amenities, guest rooms have either a king-size bed or two double beds, cable TV, AM/FM alarm clock, coffee maker, refrigerator, hair dryer, iron & ironing board, and air conditioning. The web address below provides a description of the hotel; HOWEVER, to obtain the reduced PWG reunion rate, phone the hotel directly (direct phone number is listed below). Who is invited? -- Because this Prop Wash Gang reunion is being held in conjunction with a special service to dedicate a memorial honoring airmen who perished or were injured in a fire at Syracuse University in 1959, a question has surfaced regarding who is invited to our PWG reunion. The memorial service, which is discussed later, is a public function that is open to everyone; however, only USAFSS flyers (PWG members, their spouses and significant others) and limited special guests -- those injured in the fire and families of victims of the fire, our guest speaker, Syracuse AFROTC commander, et al -- are invited to functions in the PWG reunion hospitality suite and banquet hall. Our hospitality suite and banquet facilities are simply not large enough to allow the Prop Wash Gang to open attendance at our reunion functions to USAFSS non-flyers who are in town for the memorial service. If requested, I will assist USAFSS non-flying vets who are interested in holding their own reunion concurrently in Syracuse. Guest Room Reservations -- The negotiated PWG guest room rate is $89/night + 13 % tax ($89 + $11.57 = $100.57 total per night) for Wednesday, Thursday & Friday nights. Guests who wish to stay extra night(s) will be billed $129/night + tax on Saturday and Sunday nights. Our PWGers can arrive a day or two early at the $89 per night rate. To make your reservations at the reduced rate ($89/night), call the hotel directly at 315 437-2761 and request the special PROP WASH GANG Reunion rate. To meet special guest room needs (e.g., a room that meets disabled needs, a preference of a first floor room, two double beds, etc. ), state your special needs/requests when making your reservation. Guests will be responsible for their room rent and any other charges billed to their rooms. NOTE: Check-in time is 3:00 pm and check-out time is 12:00 pm. If you desire to stay over on Saturday night (5 October), I recommend that you book your room early because Syracuse University has a home football game with Clemson at the Carrier Dome on Saturday, 5 October -- single game tickets go on sale in early August 2013 at Carrier Dome Football Tickets. Hospitality Suite and Alcoholic Beverages -- New York State law impacts reunion activities in our hospitality suite -- under NYS law, all alcoholic beverages served/consumed by persons at social gatherings in public facilities (reunions, wedding receptions, parties, etc.) must be purchased from the hotel, club, bar, restaurant or other business that operates the facility where the social function is being held. Bottom line is that the PWG must purchase from the hotel all booze that is brought into our hospitality suite -- NO EXCEPTIONS with the risk of a stiff fine for violators. As a work-around, hotel management is authorizing the PWG to purchase our alcoholic beverages (beer in case lots, wine and 'hard" liquors) directly from the hotel's distributors at cost plus a service charge and NYS sales tax (this process meets the intent of the NYS law). I will be ordering our beer, wine and any other alcoholic beverage from the hotel distributor, and the distributor will deliver purchased products directly to our hospitality suite. Our alcohol will cost a bit more than the same purchases made through Sam's Club or B.J. 's Wholesale, but the hotel is providing tubs & ice, and will ice down our beverages and empty our trash. The PWG can/will purchase our non-alcoholic drinks and snacks - thereby saving a few dollars. Our hospitality suite will be in the hotel's Pioneer Room 3, which is one-third of a partitioned large conference hall. Pioneer Room 3 will be under PWG control 24/7 from noon on 2 October until noon on 5 October. The manager requests that we keep the suite's door locked when not occupied. Reunion Banquet -- Our PWG banquet will commence at 6:00 pm on 4 October -- catered by our hotel in Pioneer Rooms 2 and 3 (next door to our hospitality suite). A hotel bartender will offer beer, wine, and mixed drinks at a cash bar in the banquet room, and bringing drinks from the hospitality suite (or elsewhere) into the banquet room is prohibited. Our banquet buffet line (an American Dinner Buffet) will open at approximately 6:30 pm. The buffet will include: tossed salad, rolls & butter, three entrees (sliced roast beef, sliced ham and mesquite grilled chicken), three chilled salads (potato salad, fresh fruit bowl and cucumber & tomato salad), garlic mashed potatoes with gravy, buttered corn, green beans, coffee & teas, and a chef's choice dessert. Per the caterer, an adequate amounts of roast beef, ham and chicken will be available for guests to choose some of each entree if desired. A 20 % service charge includes gratuity for the wait staff, and 8 % sales tax reminds everyone that we are in highly taxed New York. The loaded cost of the dinner buffet -- which includes funds to cover initial set-up of the hospitality suite (beer, wine, sodas, snacks, etc.) -- is $40.00 per dinner guest. In addition to covering the cost of their buffet meal(s) -- $40.00 x number of dinner guests -- members are encouraged to include in their advance payment a few additional dollars towards ancillary hospitality suite expenses (beverages, snacks, disposable cups and serving dishes, paper towels, etc. Purser -- Tom Emdy has volunteered to be our reunion purser. Make your check payable to: THOMAS EMDY and write "PWG Reunion" on the memo line of your check. Mail your check as soon as possible but not later than 15 August 2013. Background (Why Syracuse and why a Memorial?) - From 1951-1971, Syracuse University hosted a US Air Force foreign language training program at "Skytop," then a remote area of the university's south campus. A significant number of PWGers began their USAFSS careers with language training at Skytop, and many (including yours truly) met and married their soul mates in Syracuse, thus this will be a homecoming of sorts. In Memoriam - The Prop Wash Gang and Syracuse University are partnering in a project to create a memorial on Skytop that pays tribute to the victims of the fire and their families. The PWG is funding/delivering to the university a memorial plaque that will honor those killed and injured in the fire. 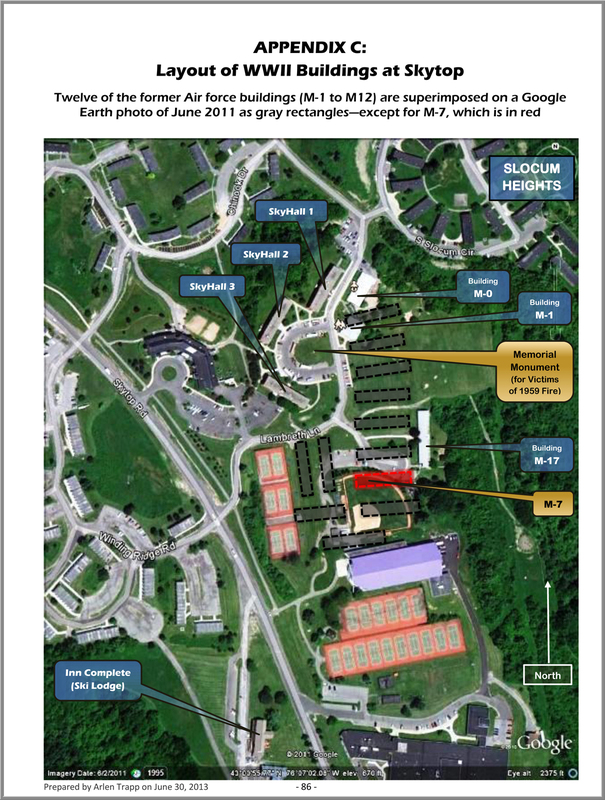 Near the footprint once occupied by barracks M-7 on Skytop, the university is designing and preparing the selected memorial site. University personnel will also mount the plaque on the newly created memorial and landscape and maintain the Skytop Memorial. Memorial Dedication Ceremony - On 4 October in an afternoon ceremony by the memorial (tentatively planned for 3:00 pm), PWG reunion attendees, Air Force ROTC staff and students from the university and Syracuse University dignitaries will dedicate the memorial. The ceremony will be open to the public. Guest Speaker -- Chaplain (Major General) Cecil R. Richardson, Chief of Chaplains, HQ USAF prior to his retirement in June 2012, will be guest speaker at the dedication ceremony. Having completed Russian language studies at Skytop (1966-1967) and served as an enlisted USAFSS voice intercept operator prior to being ordained, Chaplain Richardson has enthusiastically accepted a role in paying tribute to our departed Air Force brothers and their families. See Chaplain Richardson's biosketch here. Fun things in and around Syracuse - Syracuse and surrounding areas have lots of touristy attractions. Two that may be of interest to some of our group are a gambling trip to the Oneida Nation's Turning Stone Resort & Casino at Vernon, NY (28 NY Thruway miles east of our hotel, near Rome, NY) and a wine tasting tour in the Finger Lakes area, 60-90 minutes from our hotel. Turning Stone also has a world-class golf course and features big-name live entertainment at night. Additionally, some may want to visit points of interest on Syracuse University and maybe even stay over on Saturday to attend the SYR-Clemson football game in the Carrier Dome. Later this summer, as we get closer to D-Day, I will obtain information on local current activities around Syracuse during our reunion days. And a shopping trip to Destiny Mall may interest the wives. Meanwhile, I am open to suggestions for activities that may be of interest for our reunion attendees. I encourage anyone interested in heading efforts to arrange an event (for example, a round of golf for attendees) to step forward. Please direct your questions and comments to Larry Tart. I look forward to chatting with you at the reunion in October. FYI, after one more month in Florida, I'll be back home in State College, PA, in early April.